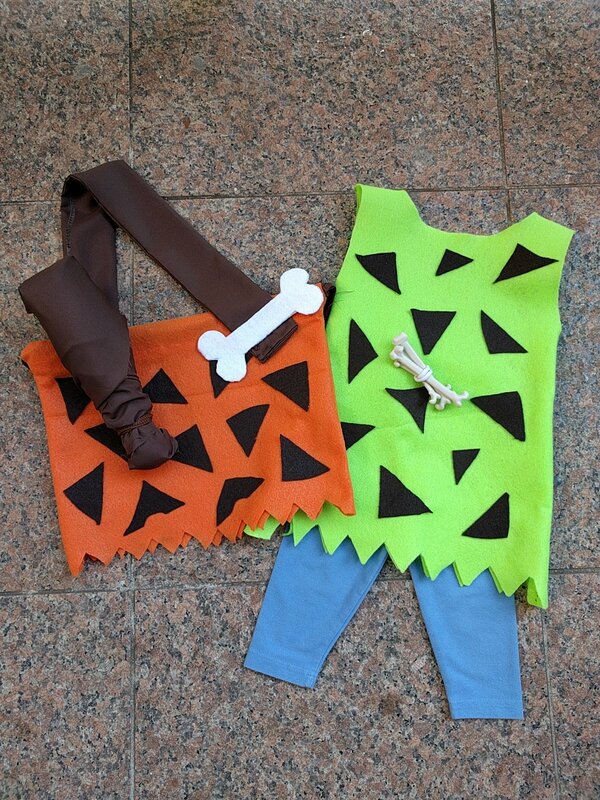 A quick, easy and inexpensive costume idea for a little boy is Bam Bam. Not only is it inexpensive for parents on a budget but it is cute as well. I purchased most of the materials listed below from Jo-Ann Fabrics or Wal-Mart. Some things I already owned. For reference, my little one is 19 months old. Grab your tape measure or a ruler if you don’t own one. You want to take the measurements of your child’s waistline and add two inches to that number. For example, if their waist circumference is 12 inches then make the width 14 inches. Learn from my mistake and don’t forget to add two inches. You will also need to measure the length from your child’s waist to their knee. I added an inch to account for the waistband. 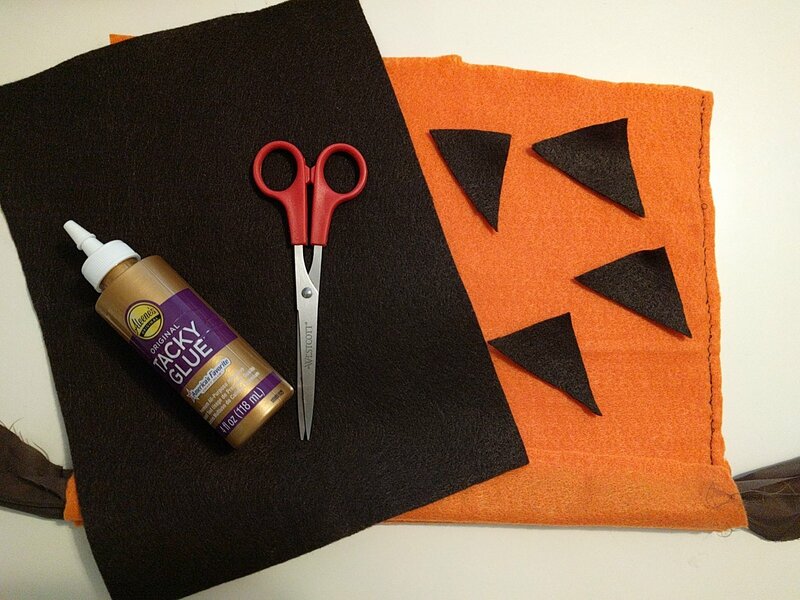 First, I folded my orange felt in half so that it would be easier to cut two pieces of the same size. I then traced the width on the felt and drew a line. The next step is to trace the length and draw a line. I did this until I ended up with what looked like a rectangle. Then cut. First, I took a ruler and laid it alongside the felt on the shortest side. [This would be the length]. I then folded the top edge down 1 inch and pinned the sides. This is now your waistband. Complete the steps on the other piece of felt as well. Initially, I glued the seams together and let it dry overnight. With a busy toddler that didn’t work out for me so I decided to hand stitch the seam using brown thread. I used one sheet of brown felt to make the decals. I cut about 25 triangles to place on the front and back of the bottoms. I started off by using a two-inch strip and folding it in half. I then cut out as many triangles as possible. After I was done with that strip, I laid them down on the remaining brown felt and cut some more. Beginning with one side, I arranged the felt decals on the dress. I spaced them out randomly until it had my desired look. This is the part where the glue came in handy for quick application. Just note, this glue doesn’t hold anything against a busy toddler. We lost a few triangles during our Halloween event. When applying the glue, I tried my best not to lift the entire decal because I didn’t want to mess up placement. So I flipped one side up to apply glue (I forgot to take a picture but it would look like you are folding the triangle in half.) Then I did the same thing to the other half. It’s probably a little hard to imagine without a photo so do what works best for you. Lastly, you flip the bottoms over and repeat these steps. This step is quite easy. All you have to do is cut triangles out on the bottom as shown. I laid the brown fabric out and cut a length of 20 inches. Since this piece of fabric was a remnant, I didn’t bother with cutting it how wide I wanted the strap to be. What I did instead was fold the fabric over itself and glued the side down. Next you need to attach this piece of fabric to the bottoms. I sewed one side down as you can see in the photo and I used a pipe cleaner to attach the other side. You can stitch both sides down or do what I did. I took this approach because I thought it would make the process of putting the costume on easier. I started with one sheet of white felt. Next, I folded it in half and used a pencil to sketch a bone. It was approximately 2″ by 6″. I then cut the shape being sure to hold both sides of the felt together. In the end I had two bone cutouts which I glued together. Lastly, glue the bone onto the cross-body strap. Be sure to place it on the side you want to use as the front. Find a plastic bat or a plastic bowling pin [which I already owned]. You can spray paint it brown or wrap it in brown fabric. I chose the latter because I had scraps of brown fabric already. 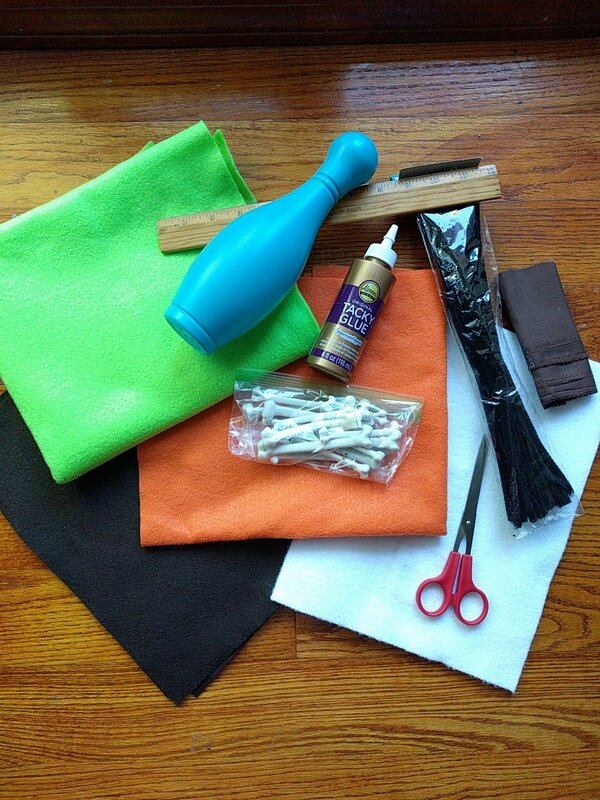 The next thing I did was wrap the bowling pin with fabric and sealed it with glue. Once you put the outfit on your child, be sure to pull the drawstring on the waist and tie it up. For cooler temperatures you can add a white onesie and shorts/ pants underneath. See pics of my little one below.